This topic describes the configuration of an Application Load Balancer. 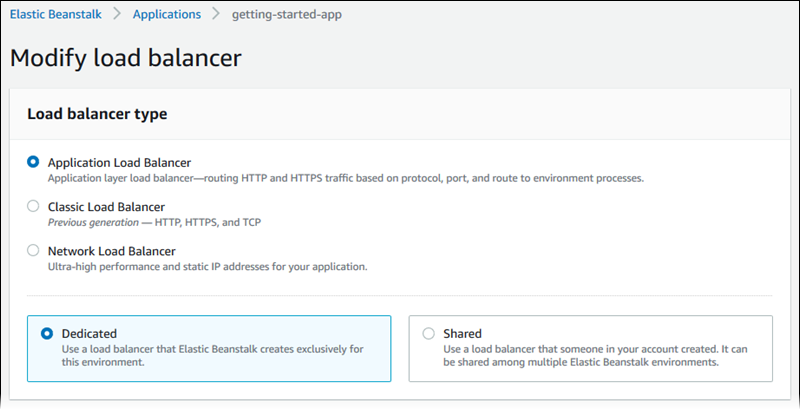 For information about configuring all the load balancer types that Elastic Beanstalk supports, see Load Balancer for Your AWS Elastic Beanstalk Environment. An Application Load Balancer inspects traffic at the application network protocol layer to identify the request's path so that it can direct requests for different paths to different destinations. When your environment uses an Application Load Balancer, Elastic Beanstalk configures it by default to perform the same function as a Classic Load Balancer. The default listener accepts HTTP requests on port 80 and distributes them to the instances in your environment. You can add a secure listener on port 443 with a certificate to decrypt HTTPS traffic, configure health check behavior, and push access logs from the load balancer to an Amazon Simple Storage Service (Amazon S3) bucket. Unlike a Classic Load Balancer or a Network Load Balancer, an Application Load Balancer can't have transport layer (layer 4) TCP or SSL/TLS listeners. It supports only HTTP and HTTPS listeners. Additionally, it can't use backend authentication to authenticate HTTPS connections between the load balancer and backend instances. In an Elastic Beanstalk environment, you can use an Application Load Balancer to direct traffic for certain paths to a different port on your web server instances. With a Classic Load Balancer, all traffic to a listener is routed to a single port on the backend instances. With an Application Load Balancer, you can configure multiple rules on the listener to route requests to certain paths to different backend ports. For example, you could run a login process separately from your main application. While the main application on your environment's instances accepts the majority of requests and listens on port 80, your login process listens on port 5000 and accepts requests to the /login path. All incoming requests from clients come in on port 80. With an Application Load Balancer, you can configure a single listener for incoming traffic on port 80, with two rules that route traffic to two separate processes, depending on the path in the request. One rule routes traffic to /login to the login process listening on port 5000. The default rule routes all other traffic to the main application process listening on port 80. An Application Load Balancer rule maps a request to a target group. In Elastic Beanstalk, a target group is represented by a process. You can configure a process with a protocol, port, and health check settings. The process represents the process running on the instances in your environment. The default process is a listener on port 80 of the reverse proxy (nginx or Apache) that runs in front of your application. Outside of Elastic Beanstalk, a target group maps to a group of instances. A listener can use rules and target groups to route traffic to different instances based on the path. Within Elastic Beanstalk, all of your instances in your environment are identical, so the distinction is made between processes listening on different ports. A Classic Load Balancer uses a single health check path for the entire environment. With an Application Load Balancer, each process has a separate health check path that is monitored by the load balancer and Elastic Beanstalk-enhanced health monitoring. To use an Application Load Balancer, your environment must be in a default or custom VPC, and must have a service role with the standard set of permissions. If you have an older service role, you might need to update the permissions on it to include elasticloadbalancing:DescribeTargetHealth and elasticloadbalancing:DescribeLoadBalancers. For more information about Application Load Balancers, see What is an Application Load Balancer?. The Application Load Balancer health check doesn't use the Elastic Beanstalk health check path. Instead, it uses the specific path configured for each process separately. You can use the Elastic Beanstalk console to configure an Application Load Balancer's listeners, processes, and rules, during environment creation or later when your environment is running. Select the Application Load Balancer option, if it isn't already selected. Make any Application Load Balancer configuration changes that your environment requires. Make the Application Load Balancer configuration changes that your environment requires. Use this list to specify listeners for your load balancer. Each listener routes incoming client traffic on a specified port using a specified protocol to one or more processes on your instances. Initially, the list shows the default listener, which routes incoming HTTP traffic on port 80 to a process named default, which listens to HTTP port 80. Use the Application Load Balancer listener dialog box to edit settings, and then choose Save. In the Application Load Balancer listener dialog box, configure settings you want, and then choose Add. Use the Application Load Balancer listener dialog box settings to choose the port and protocol on which the listener listens to traffic. If you choose the HTTPS protocol, configure SSL settings. If AWS Certificate Manager is available in your AWS Region, create or import a certificate using AWS Certificate Manager (ACM). For more information about requesting an ACM certificate, see Request a Certificate in the AWS Certificate Manager User Guide. For more information about importing third-party certificates into ACM, see Importing Certificates in the AWS Certificate Manager User Guide. If ACM isn't available in your AWS Region, upload your existing certificate and key to IAM. For more information about creating and uploading certificates to IAM, see Working with Server Certificates in the IAM User Guide. For more detail on configuring HTTPS and working with certificates in Elastic Beanstalk, see Configuring HTTPS for Your Elastic Beanstalk Environment. Use this list to specify processes for your load balancer. A process is a target for listeners to route traffic to. Each listener routes incoming client traffic on a specified port using a specified protocol to one or more processes on your instances. Initially, the list shows the default process, which listens to incoming HTTP traffic on port 80. Use these settings to define the process: its Name, and the Port and Protocol on which it listens to requests. HTTP code – The HTTP status code designating a healthy process. 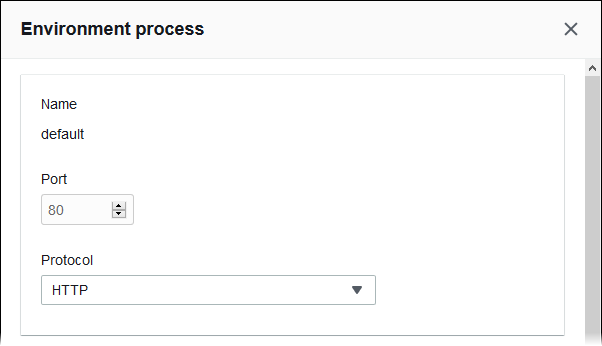 Path – The health check request path for the process. Timeout – The amount of time, in seconds, to wait for a health check response. Interval – The amount of time, in seconds, between health checks of an individual instance. The interval must be greater than the timeout. Unhealthy threshold, Healthy threshold – The number of health checks that must fail or pass, respectively, before Elastic Load Balancing changes an instance's health state. The Elastic Load Balancing health check doesn't affect the health check behavior of an environment's Auto Scaling group. 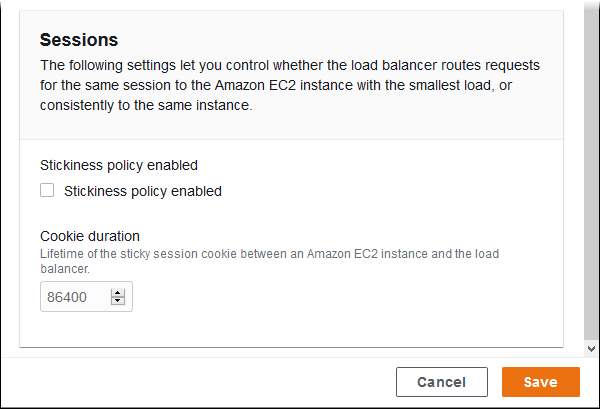 Instances that fail an Elastic Load Balancing health check are not automatically replaced by Amazon EC2 Auto Scaling unless you manually configure Amazon EC2 Auto Scaling to do so. 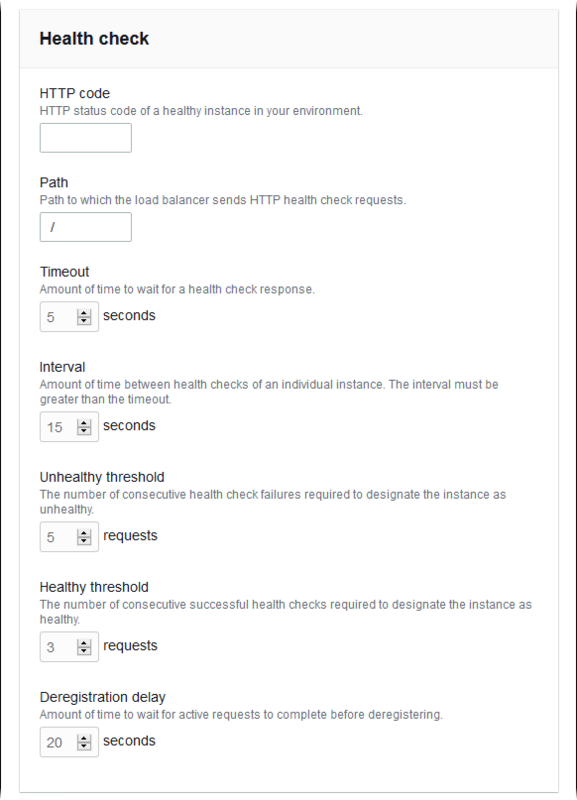 See Auto Scaling Health Check Setting for details. Select or clear the Stickiness policy enabled box to enable or disable sticky sessions. Use Cookie duration to configure a sticky session's duration, up to 604800 seconds. 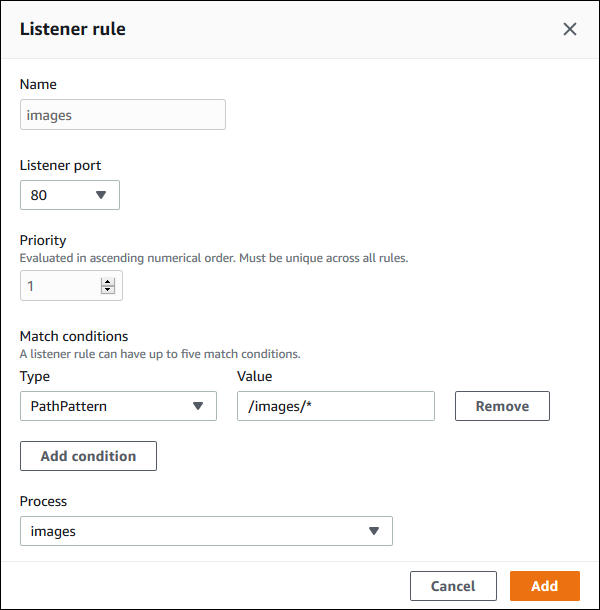 Use this list to specify listener rules for your load balancer. A rule maps requests that the listener receives on a specific path pattern to a target process. Each listener can have multiple rules, routing requests on different paths to different processes on your instances. Rules have numeric priorities that determine the precedence in which they are applied to incoming requests. For each new listener you add, Elastic Beanstalk adds a default rule that routes all the listener's traffic to the default process. The default rule's precedence is the lowest; it's applied if no other rule for the same listener matches the incoming request. Initially, the list shows the default rule of the default HTTP port 80 listener. Name – The rule's name. Listener port – The port of the listener that the rule applies to. Priority – The rule's priority. A lower priority number has higher precedence. Priorities of a listener's rules must be unique. Path pattern – A pattern defining the request paths that the rule applies to. Process – The process to which the load balancer routes requests that match the rule. When editing any existing rule, you can't change its Name and Listener port. When editing a default rule, Process is the only setting you can change. Use these settings to configure Elastic Load Balancing to capture logs with detailed information about requests sent to your Application Load Balancer. Access log capture is disabled by default. 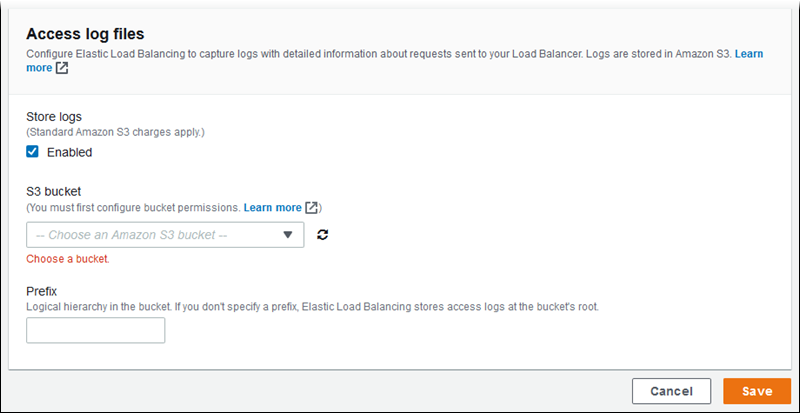 When Store logs is enabled, Elastic Load Balancing stores the logs in the S3 bucket that you configure. The Prefix setting specifies a top-level folder in the bucket for the logs. Elastic Load Balancing places the logs in a folder named AWSLogs under your prefix. If you don't specify a prefix, Elastic Load Balancing places its folder at the root level of the bucket. In this example, your application requires end-to-end traffic encryption and a separate process for handling administrative requests. To configure your environment's Application Load Balancer to meet these requirements, you remove the default listener, add an HTTPS listener, indicate that the default process listens to port 443 on HTTPS, and add a process and a rule for admin traffic on a different path. Add a secure listener. For Port, type 443. For Protocol, choose HTTPS. For SSL certificate, choose the ARN of your SSL certificate. For example, arn:aws:iam::123456789012:server-certificate/abc/certs/build, or arn:aws:acm:us-east-2:123456789012:certificate/12345678-12ab-34cd-56ef-12345678. Disable the default port 80 HTTP listener. For the default listener, turn off the Enabled option. Configure the default process to HTTPS. Select the default process, and then for Actions, choose Edit. For Port, type 443. For Protocol, choose HTTPS. Add an admin process. For Name, type admin. For Port, type 443. For Protocol, choose HTTPS. Under Health check, for Path type /admin. Add a rule for admin traffic. For Name, type admin. For Listener port, type 443. For Path pattern, type /admin/*. 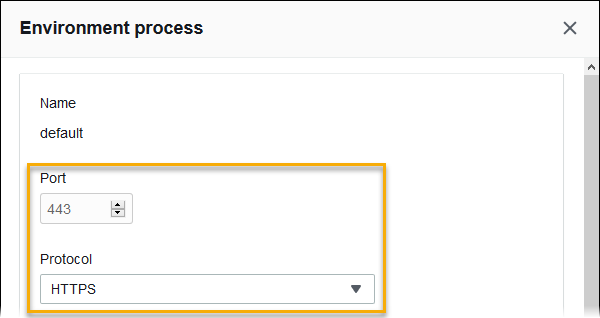 For Process, choose admin. 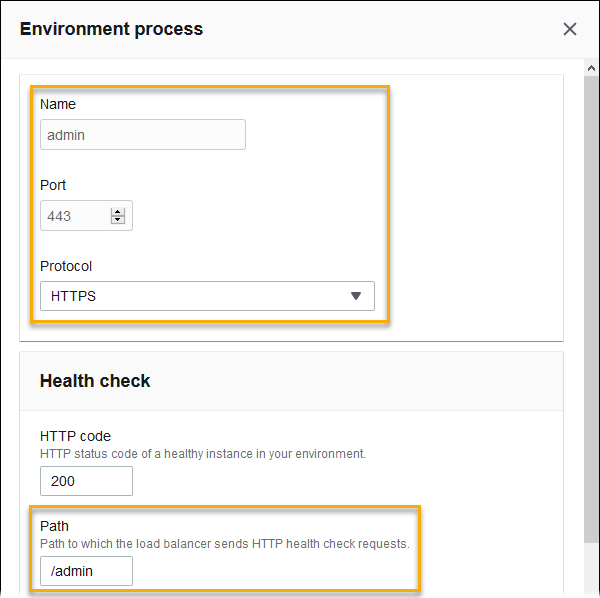 aws:elasticbeanstalk:environment – Choose the load balancer type for the environment. The value for an Application Load Balancer is application. aws:elbv2:loadbalancer – Configure access logs and other settings that apply to the Application Load Balancer as a whole. 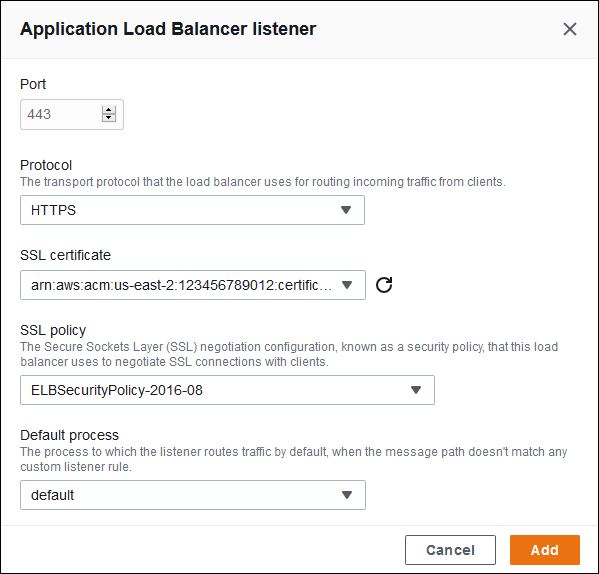 aws:elbv2:listener – Configure listeners on the Application Load Balancer. These settings map to the settings in aws:elb:listener for Classic Load Balancers. 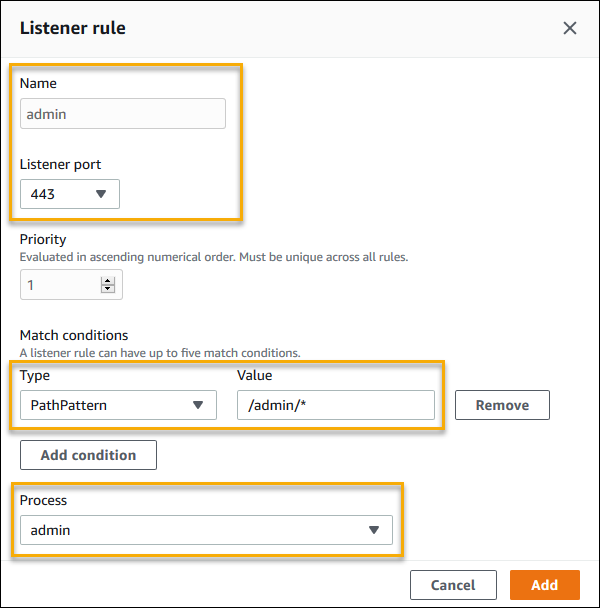 aws:elbv2:listenerrule – Configure rules that route traffic to different processes, depending on the request path. Rules are unique to Application Load Balancers. To get started with an Application Load Balancer, use a configuration file to set the load balancer type to application. The following configuration file enables access log uploads for an environment with an Application Load Balancer. The following configuration file modifies health check and stickiness settings on the default process. The following configuration file adds a secure listener and a matching process on port 443. The following configuration file adds a secure listener with a rule that routes traffic with a request path of /admin to a process named admin that listens on port 4443.